I was , as I always am , excited for my crate to arrive . I was getting concerned because it arrived after the time it usually does . Loved the mermaid vibe , especially the tail necklace and the s&p shakers! As always those little reminders that the beach isn’t too far away ! All it takes is a glance at all the beachy items and there you are .... at some beach somewhere! The beauty of it all is that the items are never too specific, so you can be transported in your Mind to your favorite beach .... can’t wait for the Sea Glass box , as that is what we call our little beach house !!! Bring it on Sea Crate !! Loved all of it my daughter in law will love it. Quick shipping. Packed well. Loved the tote, sunglasses,jewery, candy. So the box idea/theme is great.. i guess i just expected it to be more oceanie, sea overall themed items... to me this “February” box catered more towards surfing.. I did love the shells and the wave bracelet, although it wasn’t sterling or stainless. I personally just had higher hopes for higher quality pieces since the box is 49$. We are sorry you did not have a better opinion of SeaCrate. Each of our months have different themes. February "Catch A Wave" SeaCrate includes a cotton beach coverup sarong, beach-themed clock, heart-shaped shells, Surfs Up lip balm, shaka surfer pin, wave bracelet, peanut butter wave fudge, and jewelry polishing cloth. The retail value of the box is $94. 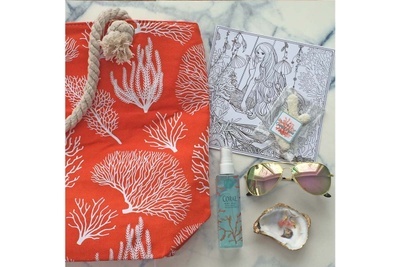 Each SeaCrate is themed around the beach and ocean and a portion of our proceeds benefits the Ocean Conservancy.